More Big 10 fun for the rest of the evening with THE Ohio State at Michigan. Michigan had a pretty good home opener last weekend against Bama. Ohio State wants to forget last weekend at UCLA never happened. Refresh the page every so often so see what happens! First rotation - Michigan starts on beam and Ohio State is on bars. First rotation in the books. Second rotation to commence. Ohio State Bars 48.925 - already a big improvement over last week's splat fest. Bridget Sloan is commentating. Yay!!! She's doing great! 2nd rotation over with, we are going to beam and floor. Michigan is on beam, Ohio State is on floor. Is Shchennikova warming up beam? I love her on beam. She's glorious!!!!!!!!! Janelle McLelland FX - double pike, sw side + popa, fro full + fro lay, double back, clean landing. 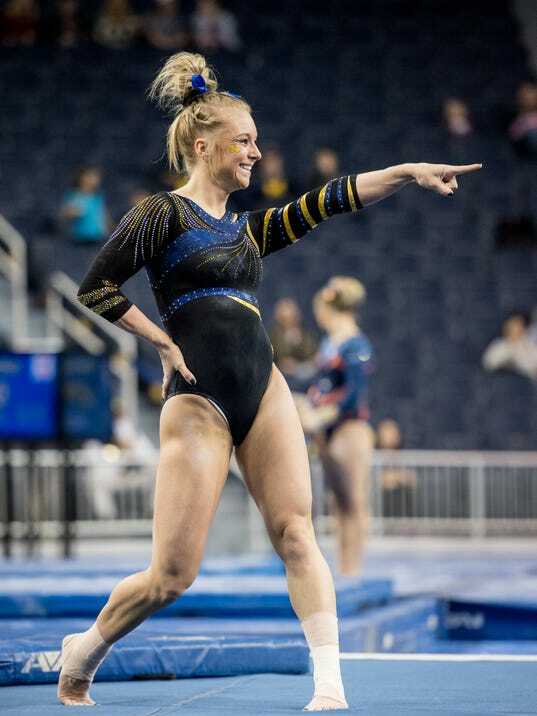 Quote of the week: "Nothing like a little Lion King to top off a floor routine." Mattern FX - beautiful DLO, tour jete full + popa, fro lay + fro full, front toss to sit, double pike, perfect landing. Great anchor. They're looking much more confident then they were last week. Fourth rotation means the final switcheroo of the meet. Michigan finishes on floor and Ohio State will end on beam. Stone BB - BHS + LOSO, another big break, but saves it, cat leap + sw side, ro + 2 1/2, big step. That's all for me tonight! Tomorrow I'll be live at the Air Force - Denver meet, follow me on Twitter for updates from that meet. Then join me Monday at 12 pm MST for the Oklahoma at Georgia meet. See you next time!